Many homeowners today want to remodel the exteriors of their home, whether to increase the value, replace older home elements, or upgrade the look. 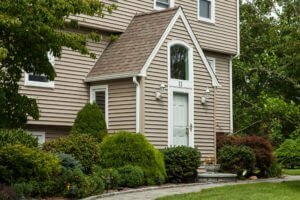 There are more than half a dozen choices as to the exterior material used to upgrade the look of a home, however, vinyl siding is one of the most popular choices amongst homeowners. Vinyl siding has come a long way in the last 10 years or so, and boasts low maintenance, variety, and the look of real wood without the costs. It’s no wonder that vinyl is a leading option. As with any decision, the pros and cons should be weighed against each other to determine if vinyl siding is the best bet for your home. This is definitely a key feature that you’ll likely want your siding to have. The weather can be brutal on the exterior of your home, especially here in Rhode Island and Massachusetts. Sunlight, rain, snow, and wind are just some of the elements that can bear down on your siding. That’s why vinyl siding is one of the best options available on the market. Vinyl comes in three different thicknesses, which dictates how long the siding can last for. The heavier the gauge of vinyl siding, the more durable it will be. No matter which thickness you choose though, vinyl is extremely strong and durable, which will protect your home and prevent the need to replace your siding sooner rather than later. The cost of producing vinyl siding is much lower than other types of siding, which means choosing vinyl siding is a more wallet-friendly option. It’s one of the least expensive sidings available today. This is a big plus for homeowners looking for a budget-friendly option. Vinyl siding is extremely easy for a siding contractor near you to install. Not only are the initial costs of vinyl siding less than other types of sidings, but the vinyl installation is also fast and inexpensive as well. Since vinyl siding is light weight and has an interlocking design, it can take a professional vinyl siding contractor less than a week to install it. One of the primary reasons that vinyl siding has become extremely popular is because of the low maintenance. Once vinyl siding is installed on your home, there is very little maintenance to perform for the next 30 or 40 years. Once a year, your vinyl will require a good cleaning to keep it looking new and fresh; not bad for a little home maintenance. Over time, the colors of the vinyl will eventually begin to fade and might need to be repainted every eight to ten years to keep the color vibrant. This isn’t your grandparent’s siding. Vinyl siding has come a long way since as soon as ten years ago. Today’s siding comes in a gorgeous, versatile color and texture palette. The siding is seamless and mimics the look of real wood. There are hundreds of options to choose from including colors and textures that comply with historical home standards. It’s true that most vinyl siding can withstand the majority of weather conditions, but some siding can become damaged in very severe and harsh weather. In extremely cold weather, for instance, the vinyl siding can become brittle causing it to crack. Cracks in the siding allow water to penetrate behind the vinyl where moisture, mold, rot, and damage can harm the framing of the home. In addition, vinyl doesn’t insulate very well. To help with insulation, the home needs to be insulated with a heavy-duty insulation or wrapped with an insulating house wrap, which incurs additional costs that the contractor should factor into the total cost. 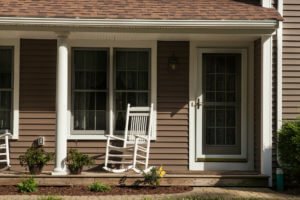 Unlikely, but still worth noting, in extreme hot weather conditions that aren’t the norm, vinyl siding has been known to melt and cause severe problems. Unfortunately, vinyl siding can get dented, even the heavier gauges of siding are prone to dents. All it takes is a heavy object such as a branch, stone, hail, ball, or even a power washer, hitting the vinyl to create a dent. Dents won’t easily pop out. Instead, if a panel does become dented, the panel needs to be removed and a new panel inserted. Because of the interlocking system, replacing a panel is extremely time-consuming, difficult, and can be expensive. 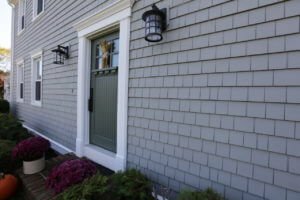 Vinyl siding comes in a variety of colors, however, if a panel is dented or damaged and needs to be replaced, it can be difficult to match the color. If the siding is older or exposed to harsh sunlight, the color has likely faded. Matching the new panel up with the current siding can be extremely difficult. However, the new panel could be painted to match or the whole house could be repainted if the siding needs a refresh. Whether you choose vinyl siding for appearance or durability, it’s always important to research vinyl siding options and look for a professional vinyl siding installer near you who can answer all of your questions. All of the pros and cons should be weighed against other siding options and what makes the most sense for your home, budget, lifestyle, and family. Should You Paint or Reside Your Home? Should I paint or reside my older home?